As testing shows that literacy standards are falling (Cramb, 2015) it seems evermore important that children get the foundation they need upon which to build these vital skills. Children learn through experience. To become readers and writers, children need to experience reading and writing environments, observing that this is part of life. There is much to be learnt before children start the formal process of becoming literate when they start school. It is long recognised that children need to play, that they need to develop at their own pace and that they need to have experiences through which they can learn. Formal learning whilst sitting at desks is not appropriate for active youngsters who need to be feeling, doing and moving. Children need engaging and enjoyable activities through which they can learn. Musical activities are an ideal way to encourage social participation and build many early skills which contribute to later literacy learning. Gathered from research, the diagram below summarises the main requirements for becoming literate. It also suggests that music may be used as a conduit for this learning. Phonological awareness (the awareness of individual and groups of sounds within words) is identified as a major determinant of success in literacy (Bradley and Bryant, 1983; Goswami, 1990). Anvari et al., (2002) found that musical skills correlated significantly with phonological awareness and reading. Musical rhythm can be used to help children learn to detect syllables in words; musical rhymes have rhyming endings which can be brought to children’s attention and alliterative rhymes (those with repeated first letter sounds) for example, ‘Five Fat Peas in a Pea Pod Pressed’ can help children to identify individual letter sounds. Children must have an awareness of differences in spoken sounds and differences in shape before they can learn to match the two – letters to language sounds. Additionally, they must also know the purpose of text and how books work and be motivated to want to decipher the alphabetic code. Linnea Ehri (American psychologist and Distinguished Professor) describes literacy as ‘One of the great mysteries’ (Ehri, 2005:168). Becoming literate is a multi-faceted and complex process. Literacy also requires cognitive skills, not least, the ability to remember. RAN is the ability to name items quickly; this is what happens when we become proficient readers, we do not stop to analyse each letter in every word but quickly identify the words we see. Children must also understand the language which is spoken to them, be aware of cause and effect (putting items and storylines in sequence and knowing what follows what) and be able to pay attention to their environment and what is said to them. 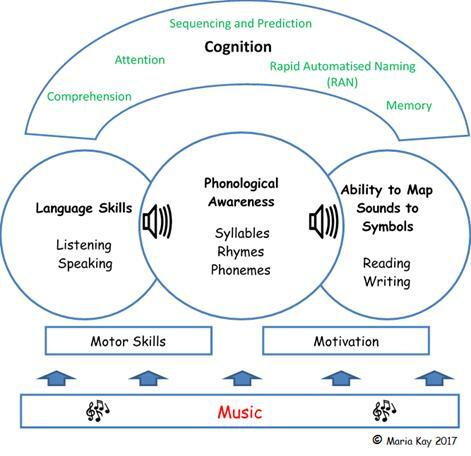 Musical activities can be used to promote each of the skills in the diagram. Musical activities allow repetition which is great fun. Rote learning is arduous but repeated singing and playing of favourite songs and musical games is not. Repetition helps to embed learning as it facilitates memory retention. Many rhymes and songs help us to learn sequences, such as days of the week, months of the year, numbers and the alphabet. Singing a musical story can also assist memory of the sequence of events. Try this one – Sleeping Beauty with Sounds and Symbols. Maybe surprisingly on the diagram is ‘motor skills’. Music and movement may ultimately impact positively upon literacy learning. Music is motoric – it makes us want to move. Movement stimulates the brain. When the brain is in a learning state (relaxed, as opposed to one of anxiety) it is most receptive to environmental stimuli. Research has shown that kinaesthetic learning (learning by doing) is a preferred learning style for young children. Children also learn through sound and sight. Our senses inform our brain and then the brain instructs the body – it’s a two-way process. Motor skills are also required for writing. Children must be able to control a pencil on paper. Gross motor skills (big movements) develop before fine motor (small movement) skills. Hence, encouraging movement to language, as in song, helps children to bring motor and language skills together. 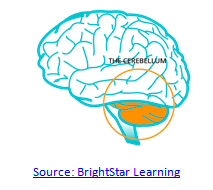 The cerebellum (a part of the brain at the back of the head) is responsible for helping skills (such as reading and writing) to become automatic. It is also responsible for motor skills and timing. This information helps us to see how music, movement and literacy can be related, as music can help the development of both movement and language. Children who have difficulty with literacy often also have difficulty with keeping a beat (Goswami, 2013)). Children need to be able to keep time. Bodies move in time in order to function effectively. Moving to rhythms helps to embody language sounds, such that they become part of one’s being; this may subsequently impact upon literacy ability. Communication is also presented through movement in the form of gesture. Gestures support our spoken words and may even help the brain to function (Özçalışkan and Goldin-Meadow, 2009). The act of gesturing can help us to retrieve the words we need. Children use gesture to communicate before they learn to speak. Hence, performing action songs and rhymes helps children to develop their language skills. However, simply performing songs and rhymes does not automatically confer benefits to literacy learning. 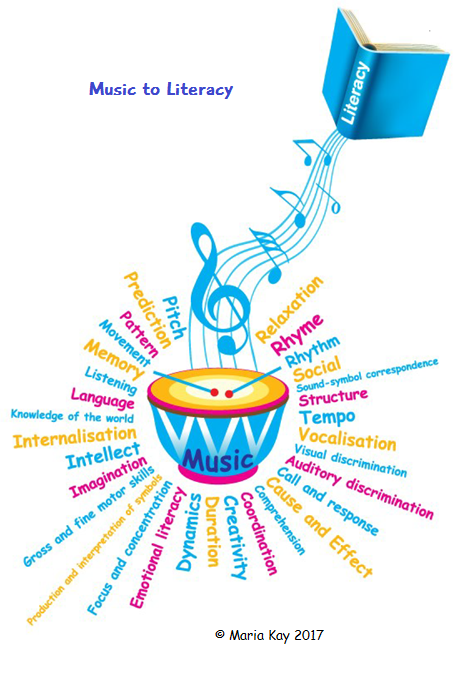 The literacy outcomes need to be embedded into the musical activities. A person wishing to promote early literacy learning through musical activities, must be aware of the skills and knowledge they are aiming to foster, and not rely on an automatic transfer of skills between domains. The diagram below shows where these links can be made. Music encourages focus and attention and is multisensory. It can be used to help children to focus their listening upon important features of language. Through deliberate attention to these features, many early literacy skills may be fostered. Children can build a secure foundation for many of the skills required for later literacy through appropriately designed musical activities. Such activities offer a playful and active means of learning. Sounds and Symbols has a website and a FB page. Maria is a research student and author and writes regularly for Teach Early Years magazine, where you can find a wealth of information on early years education. Click on the hyperlinks throughout this article to access the websites. Anvari, S. H., Trainor, L. J., Woodside, J. and Levy, B. A. (2002). Relations among musical skills, phonological processing and early reading ability in preschool children. Journal of Experimental Child Psychology, 83, pp.111-130. Bradley, P. and Bryant, L. (1983). Categorizing sounds and learning to read: A causal connection. Nature, 301, 419–421. Cramb, A. (2015) Literacy Standards Decline The Telegraph. Ehri, L. C. (2005). Learning to Read Words: Theory, Findings and Issues. Scientific Studies of Reading, 9 (2), pp.167-188. Goswami, U. (1990). A special link between rhyming skill and the use of orthographic analogies by beginning readers. Journal of Child Psychology, 31, 301–311. Goswami, U. (2013). Dyslexia – in tune but out of time, The Psychologist, 26 106-109. Özçalışkan S. and Goldin-Meadow S. (2009). When gesture-speech combinations do and do not index linguistic change. Language and Cognitive Processes, 24 (2) 1-25.